her tongue turned to stone. Posted on April 12, 2012, in haiku, Haiku Heights, NaPoWriMo, senryu, The April Heights 2012, We Write Poems. Bookmark the permalink. 7 Comments. And Crows and Cornhusks…One must get lost in a cornfield I think at dusk with crows to understand… enchanting, as always. 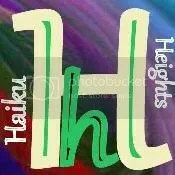 Your haiku set is a magic!!! One by one they tell magical stories!!! My favorite is ‘the idiot’s tale.’ So true! There are quite a few countries that could be 2.